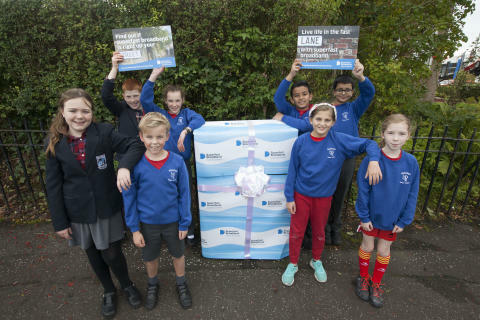 Braidbar Primary School pupils discover the benefits of fibre broadband. More than 800 homes and businesses in Giffnock are now able to connect to high-speed fibre broadband thanks to the £428M Digital Scotland Superfast Broadband programme. The Digital Scotland team celebrated the latest fibre availability in the East Renfrewshire town this week as they visited a fibre street cabinet that will serve part of the local area. They were joined by senior pupils from Braidbar Primary School who discovered what goes on inside the green street cabinets. The latest premises are among around 780,000 homes and businesses across Scotland which are now able to access fibre broadband through the Digital Scotland rollout. Other areas in East Renfrewshire to benefit from the rollout, led by the Scottish Government, include Thornliebank, Barrhead, Busby, Newton Mearns, Uplawmoor, Clarkston and Eaglesham. More local coverage will follow as engineers from Openreach – Scotland’s digital network business - continue work on the ground. East Renfrewshire Council Leader Tony Buchanan said: “It is great news for Giffnock and the whole of East Renfrewshire that more and more households are able to connect to fibre broadband. This service will provide many opportunities for homes and businesses, and I’m sure will be welcomed by all. Sara Budge, Programme Director for Digital Scotland Superfast Broadband, said: “It’s fantastic news that the programme has been able to benefit residents and businesses in and around Giffnock. Digital Scotland funding partners include the Scottish Government, Highlands and Islands Enterprise, the UK Government through Broadband Delivery UK (BDUK), local authorities and the European Regional Development Fund. BT Group is investing £126 million in the rollout, and the total project value includes around £18 million which is being reinvested back in to the programme as a result of stronger than expected early take-up. Robert Thorburn, Openreach client director for Scotland, said: “It’s great that pupils from Braidbar Primary School were able to get an insight into how high-speed technology powers the internet and learn about a very positive side to a career in engineering. People living in a new housing development near Giffnock are set for a major broadband boost - thanks to a superfast crowdfunding appeal and Openreach’s Community Fibre Partnership scheme. 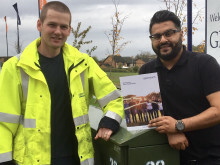 Glenmill resident Nav Sadiq used the crowdfunding service Spacehive to raise the money needed to co-fund the project with Openreach within a week.